DermaSeptin Soothing Skin Protectant Ointment is a non-prescription skin cream that provides a barrier to prevent irritation from moisture and to promote healing. It features the active ingredients of Zinc Oxide and Menthol. 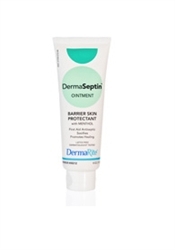 DermaSeptin Ointment is used for skin irritations caused by incontinence episodes, feeding tube leaks, wound exudates, and perspiration. It can also be used for diaper rash and minor burns and scrapes.